Nimrod Nunn Western was born in Carlton Scroop (or Grantham) in April 1889. His mother was Mrs Leah Western but in 1891 (aged 1) he was living with his grandmother Anne Western (charwoman, born Great Gonerby) and her unmarried son John Barker Western (age 26, born Carlton Scroop). They seem to have been on Charity Street with the Manor House on one side and the Bembridge family on the other. In 1901 Nimrod was a boarder with David & Hannah Beecham (and their daughter Ellen) 2 doors from the Coach & Horses in Charity Street. He enlisted with 7th (Service) Battalion Lincolnshire Regiment, regimental number 10450. E. Reginald Silkstone from the village, who was the same age also joined 7th Battalion. His service number was 10451 so it seems likely that they joined together. The battalion arrived at Boulogne on 14 Jul 1915 as part of 17th (Northern) Division of the New Army. It first operated in the Voormezeele area of Belgium, in the Ypres salient. It remained in the Ypres sector until the end of year when it was from the front line for training. During the ‘Actions of the Spring’ 1916 the Division was involved in fighting at the Bluff (south east of Ypres on the Comines canal). On 7th Feb 1916 the 7th Lincolnshires were in the trenches at the “Bluff”. On 14th Feb the Germans took the Bluff. 7th Lincs (who had bee in reserve at the time) took part in a number of failed attempts to retake the position until it was relieved early on the 17th having lost 26 killed, 78 wounded and 3 missing. 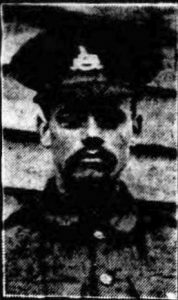 Private Nimrod Western (age 26) was killed in action during the battle on 2 Mar 1916 when 7th Lincs recapture the Bluff, suffering 34 killed, 184 wounded and 16 missing. His grave is not known, but his name is commemorated on the Menin Gate.